by laying on of hands." Knowing God’s call in your life is a process of discernment. It can be hard to know where we are being called upon to use our gifts. Our diocese offers a website that aids in this discernment, and it can be found at www.tulsavocations.org. For young men considering the priesthood, please contact the Diocesan Vocations Office at 918-599-0204. As successors to the apostles, bishops share fully in the three-fold apostolic mission given by Christ to his Church, namely that of teaching, sanctifying, and governing, and by ordination they are given the fullness of the sacrament of holy orders. A diocesan bishop is the chief pastor of a local church, or “diocese,” which normally consists of the faithful within a given geographical area. The Church of the Madalene is part of the Diocese of Tulsa (www.dioceseoftulsa.org), which consists, roughly, of the area of Eastern Oklahoma, and which is under the pastoral care of Most Rev. Edward J. Slattery, Bishop of Tulsa. The primary role of the priest is to offer the sacrifice of the Holy Mass and to preach the gospel of Jesus Christ. Depending upon his state in life (for example, whether a secular or religious) and particular assignment, a priest will also engage in other areas of ministry. 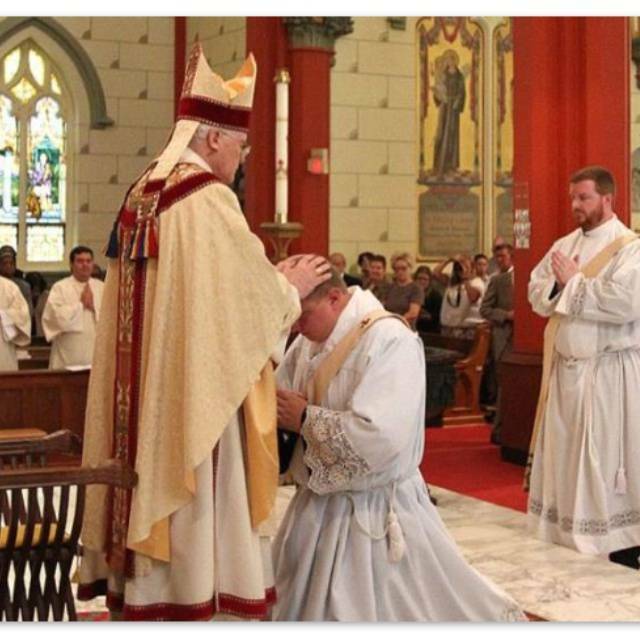 Deacons are special co-workers of the bishop in his task of “diakonia” or service, and they therefore receive the sacrament of holy orders in such a way that they are specially configured to Christ the Servant. While deacons may be assigned any number of duties for the good of the local community, as with the bishop and priest their public ministry finds its pinnacle and source of strength in the Divine Liturgy of the Church, especially in the Holy Eucharist, at which they are the prime assistants of the bishop and priests. The Catechism of the Catholic Church mentions examples of other common duties of the deacon, including “...the distribution of Holy Communion..., assisting at and blessing marriages..., the proclamation of the Gospel and preaching..., presiding over funerals..., and dedicating themselves to the various ministries of charity” (Catechism of the Catholic Church, 1570). The Church of the Madalene is served by the Rev. Deacon Robert DeWeese, a deacon of the Diocese of Tulsa.